Week 4 – Free Offline Genealogy Tools: For which free offline genealogy tool are you most grateful? How did you find this tool and how has it benefitted your genealogy? Describe to others how to access this tool and spread the genealogy love. Got caught up in a small project for one of my “Free Offline Genealogy Tools”. I am a member of a group of genealogists that meet monthly at a local (not so local for me) Library. What is great about this group is the Name of the Group. Family History Interest Group. They have been meeting for a little over 10 years at the Bernards Township Library, in Basking Ridge, New Jersey. The name of this group, to me, is key. It’s not just about genealogy, but the gathering of Family History. The group meets monthly, except for December, and has a wide range of speakers. Dan Lynch of Google Your Family Tree, Daniel Horowitz of My Heritage, to mention two national presenters. Book authors, TV program producers and many non-members have sharing with the group. This group has it’s own long list of presenters, each sharing their own experience. Several times a year, a “Round Table” discussion is scheduled, where each person becomes a “presenter” either by asking questions or answering questions that are asked. The former resource librarian and now the current Library Director has been gathering the speakers and the group for over 10 years. It’s a wonderful, FREE, Offline Resource. The second Off Line Resource, for me, is the New Jersey State Archives. What I like about it, is that you can prepare for your visit by checking out that they have available before you go, then visit the most helpful group of staff around. They are always willing to show you where to find what you are looking for and some times help you find what you haven’t expected to find. Lesson Learned: Visit your Local Library and your State Archives. Genea-Blogger, Thomas MacEntee, today asked What our RootsTech Strategy will be for 2012. Please see his blog: Open Thread Thursday: What’s Is Your RootsTech Strategy? Actually, I have thought about this in preparation for this awesome experience. Having attended several “regional” events, including the New England Regional Genealogy Society event last spring, I know that I don’t want to get overwhelmed with this event. Trying to be involved with the Conference, as a participant, spending time in the Exhibit Hall, and networking with the 80+ Genea-Bloggers, I am sure that it can be too much to handle. My plan, follow as much of the planned schedule that I have already planned on, BUT be flexible enough to make changes “on the spot”. There is a lot of opportunities to learn. I want to take advantage of that. I like Thomas’ term micro blogging. I will have my iPad with me and will try that. I am going to use that to take notes, as I did at the NERGS last spring, but do the note taking in Evernote, which I have been using for Webinar Notes. Now to learn how to Copy and Paste, quickly, between Evernote and Twitter on the RootsTech 2012 AP on the iPad. But, I have a couple of days to learn that. I hope you will bear with me on this Great Genealogy Adventure. This challenge runs from Sunday, January 15, 2012 through Saturday, January 21, 2012. 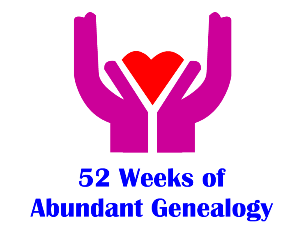 52 Weeks of Abundant Genealogy (http://www.geneabloggers.com/tag/52-weeks-of-abundant-genealogy/) by Amy Coffin is a series of weekly blogging prompts (one for each week of 2012) that invite genealogists and others to discuss resources in the genealogy community including websites, applications, libraries, archives, genealogical societies and more. You do not have to be a blogger to participate. If you do not have a genealogy blog, write down your thoughts on your computer, or simply record them on paper and keep them with your files. I have to say that my first Online Genealogy Tool if the Find-A-Grave website. In reality, it’s a tool in two ways. 1) gives me a chance to get out and about, to help others (give back to the community) and 2) for my own research. I was able to put a genealogy together, for a friend of mine by visiting ONE Cemetery, look at ONE Monument and put together a 3 generation genealogy for him. I went to another cemetery and went back two more generations. All of the pictures were on both Find-A-Grave and on my Headstone Blog. Based on that experience, I have given a number of genealogy talks, in the local area, on how I used the Find-A-Grave website to do my research. Two of the talks were to local Historical Societies. Initially, I thought that wasn’t right, what do I know about a Historical Society. Then it dawned on me that they were trying to document and preserve the history of the Local Area, and I was doing the same for my Family. The first of those talks, as off shoots, the Historical Society and I went to two cemeteries, to help record and/or update a listing that they had, and I was adding photographs for Find-A-Grave at the same time. The second cemetery we visited was an old Family Burial Ground, where there was only ONE stone, and it certainly was not in the right place, because the property owner didn’t want the “kids” to get hurt with that stone. A group of 6 of us, and 2 divining rods located what is believed to be the burial ground with, it appeared to be, 15 burials. It was in the “back yard” and neighbor, of where the headstone was. The house was the home for that family who was reported to be buried there. Two adventures based on the Find-A-Grave website. For my own research, the Inferential Genealogy series I posted here, also included Find-A-Grave. Both in what I found and didn’t find. But that was also taken care of with a visit to the Cemetery and taking photographs. But sometimes, Find-A-Grave and visiting Cemeteries lead to other questions about families. Like, why are some members of the family in one cemetery, while others in another cemetery, or even another Plot within the same cemetery. Another cemetery visit I made, was for a friend, and Genea-Blogger, where I took pictures of the Surname I was looking for, to see if we could put families together to help know down a brick wall. I have to say that this one is still a work in progress. But between Census Records and Cemetery Plots, without other documentation, families can be put together, or at least that is my experience. Other Free Online Tools: FamilySearch.org would be my next tool. I haven’t used that site as much as I should, but I do hope to learn more about that website at RootsTech 2012. There are a couple of other Online Tools that I learn more about at RootsTech 2012. I am expecting that after that trip, I will have more to say. I should mention that having your genealogy research posted online is very helpful. I am in the process of cleaning up my main Genealogy Management file, and realized just how many Onlilne Tree’s I have Source and Citations from. In turn, I have some of my research online as well. Don’t forget about Blogs. I have received many tips from this Blog. For example, I posted one post, and within an hour I had two “new” cousins. Blogs, as they say, are Cousin Bait. Social Media is also in the mix. Having a Facebook, Google Plus, and Twitter account have helped as well. Another Tombstone Tuesday Blogger has posted some photographs on her Blog of a number of my ancestors in Kansas. I’ll never get to Kansas, but I have pictures of where they are buried. After I had thanked her, she went out of her way to go back as see if she could find anyone else. I am sure that I missed some, but these are a couple of my Free Online Tools. Which paid genealogy tool do you appreciate the most? What special features put it at the top of your list? How can it help others with their genealogy research? This challenge runs from Sunday, January 8, 2012 through Saturday, January 14, 2012. This one is easy. I use Ancestry.com. Two reasons for that is the number of types of records that are found there, and the records and types of records. The second reason is the ability to use Genealogy Management software with the records on Ancestry.com. I think the best example happened a couple of days ago. I was looking at and working on my own ancestry, doing some clean up of the file after 12 years of using the same file. Am taking the tile to make sure that some old data / information is brought up to the way I am handing that information now. I found a Shaky Leave (Hint) for my Father. I haven’t seen a new hint for a number of years. There were TWO new Hints. Wow! One was an obituary for him, but the second was a link to the Burlington County records website, where I can order the death record for my father. I have NOT seen that one before, nor that type of record. Both of this hints lead to an Index on Ancestry with a link to an external website, where the record could be ordered. The best news here is that I didn’t even have to “go looking for it” it came to me. I did a Web Merge, from Ancestry.com into my Family Tree Maker Version 2012 file with the Link, downloaded, filling in a form, and am ordering his death record. I do find two other Paid Website very, very helpful. Many of the Civil War records that I have posted on this Blog have come from Fold3. Great military website. I have listened to Tom Kemp, of GenealogyBank, on a couple of webinars. Somewhere during each of his talks, I hear “and don’t forget about newspapers”. I am not sure he uses those exact words, but that is what I hear. One evening, I was attending a local Family History Interest Group, and the talk was to be about GenealogyBank, but the Library Edition, as we meet at a local library. I had just listened to Mr. Kemp talk, and took a chance at doing a search for a story that had taken place at Montmorenciy (talked many times here about that). The story was that one of the owners of that house had been murdered. Hum. A very quick search on GenealogyBank found THE newspaper article that told, in vivid detail on what happened. These paid websites have helped me move from being a “name collector” to more of a Family Historian. That is to put Stories about the Names that I have. To me, it makes them real. Side Note: I am still waiting for GenealogyBank to have THE newspaper that has the story of my Grandfather and two of his siblings, arriving in Philadelphia, PA in 1897, where they were NOT met when they arrived by train, with name tags on their toes, after their parents and grandparent died. The story goes that they were taken to a police station, a news paper article posted, and relatives arrived to pick them up. There was a communications issue with the folks that were to pick them up, due to a Ship Wreck on the Jersey Shore that messed up the mail. Can’t find that article either. BUT I keep an eye on the GenealogyBank Blog for their updates. I am going to try this, for a while. It may be helpful for me. I have lost count on the number of Blogs that I follow. I watch Genea-Bloggers weekly list of new Blogs, found some of my own, but generally the Blogs that I follow are about Genealogy or Family History. It’s a way for me to learn. Sometimes, I will take such a learning experience, try it out, and share it here. I think that each of us learn in different ways. What’s nice about the Genea-Blogging community, is the sharing that takes place. There are different types of Blogs. I know, because I have three. This one, mostly about the Worthington Surname, but it’s also about my experience with Genealogy. My second on is about Family Tree Maker, and the third is pictures of Headstone. For the past 10 or 12 years, I have been responding to about 25 message boards, most of them about the Family Tree Maker program, and some times it’s easier to show how to resolve a problem, with a Blog, then all on the message board. One way I have learned to use the program myself, is to blog about it. How to use a “new feature”, what are the new features, how can I work around a situation that isn’t in the program (yet). There are other Blogs that do similar things. “How to ….” do genealogy or family research. Each of the several hundred Blogs that I follow, some I read word for word, some, not so much. When I did some website development and maintenance, I always said that you have about 15 seconds to get someone’s attention on a website. The same goes, for me at least, for a Blog. Many of the Blog posts I will read in Google Reader, but some times I’ll go to the Blog itself, especially to post comments. I think it is important and helpful to post comments. It’s a way to encouraging the Blogger to keep posting, to let them know that someone is reading their work. There are also times to ask a question. Some times there are opportunities to meet the Bloggers in person. Genea-Bloggers are the BEST. My two cents of Blogs.